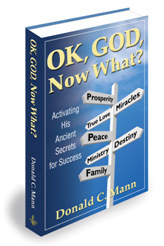 Need Answers to Problems, Challenges, Dreams & Destiny? They found their best answers. "I have problems overwelming me, and my dreams are going nowhere." "I don't know what it is, but in my gut something is missing or undefined. I can't quite put my hand on it, but it is real and I know it is out there." "How can I have a better life? Where can I find true happiness?" If you can relate to these in anyway, pick a topic of interest below and see what others have said how OK, GOD, Now What helped them. Click on the topic of your choice below to see testimonies, or at the tabs on the upper left. Better LIfe Jump Start My Ministry Need More Faith? Unexpected Path to Success - Sherry's Story from Donald Mann on Vimeo. Go to OK, GOD, Now What?